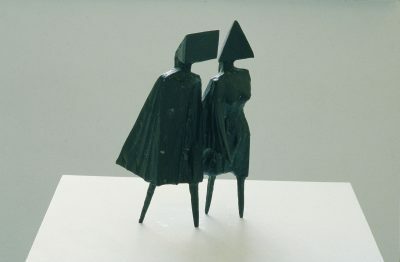 Lynn Chadwick trained as a draughtsman and joined an architectural practice in 1933. During the Second World War he served as a pilot and afterwards worked as a designer of trade fair and exhibition stands. From 1947 he began to construct mobiles out of wire and balsa wood, later adding ground supports to anchor the works. Chadwick had his first one-man show in 1950, contributed sculptures to the British entry at the Venice Biennale in 1952 and in 1956 won the prestigious International Sculpture Prize at the Venice Biennale. Tate Britain held a major exhibition of his animal and human forms in iron, bronze and steel in 2003.